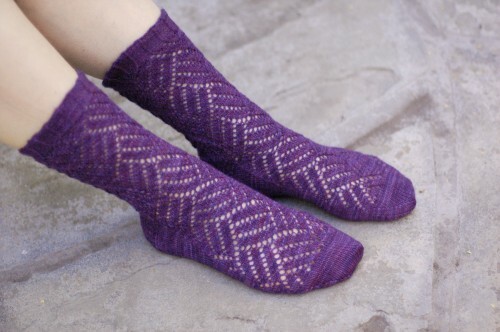 Flight and Striation were the final patterns from the 2012 Cookie A Sock Club and they are now available to the public! Flight features a not-too-complicated airy feather motif. Striation’s geometric lace pattern is mirrored from left to right. The yarn is Sinful Sock from Stricken Smitten, a luxurious cashmere blend in a deep, rich violet that proved nearly impossible to photograph accurately – but was so lovely to work with! The time is now to think about joining the 2014 Cookie A Sock Club! We’d love to have you join us for a year of new sock patterns, independently produced yarn, and delicious cookie recipes. For more information visit http://www.cookiea.com/club/. This entry was posted on Sunday, December 15th, 2013 at 9:04 pm and is filed under Patterns, Sock Club. You can follow any responses to this entry through the RSS 2.0 feed. Both comments and pings are currently closed.